A modified variety of pennycress developed by CoverCress Inc. grows in a trial plot. The company has identified up to 32 million acres of Midwestern farmland where the winter cover crop can ideally grow between rotations of corn and soybeans. The crop has the potential to deliver up to 2.4 billion gallons of additional feedstock for biodiesel and renewable diesel—one of many supply sources from which the ag and waste industries can meet growing demand. PHOTO: COVERCRESS INC.
writer is his own first editor, leaving scraps of facts, figures, data and quotes on the cutting-room floor in an attempt—however successful—to cohesively and clearly tell a story. The assignment pitch, deadline, page count, audience, his knowledge of the subject matter, and his own personal world view all contribute to the decisionmaking process of what to include and what to leave out. Some writers may complain when faced with too much information. I seldom face this problem. For me, the worst and hardest article to write is the one for which too little material is gained during the information-gathering phase. It just doesn’t work, and the writer’s lack of subject matter knowledge glares back at the reader like—well, like a poorly written, ill-informed article. Anyone can identify the signs: vagueness; skirting, or writing around, the issue; brevity when a deeper analysis is called for; a lack of primary sources—or even worse, citing secondary sources such as another news outlet. In my humble opinion, information-gathering—research, interviews, attending technical sessions at events, and deliberation—is the most important and intense part of the writing process. During this phase of my page-14 feature, “Where Will All the Feedstock Come From?” I spent weeks interviewing some of the most revered feedstock experts in this space—Stephen Kaffka, John Cusick and Alan Weber. My interview with Weber led me to CoverCress and its CEO Jerry Steiner. When all of my interviews were completed, the word count of my notes from these four sources alone was in the tens of thousands. For me, this is where I want to be when I begin writing an article. Sure, my nearly 15 years as a writer in this sector, notebooks full of handwritten notes from recent industry events, and access to a world of information through the internet help. But the perspectives of primary sources such as these are invaluable. Like most feature articles that I write, despite this article being 4,500 words long I am left with a plethora of information that did not make it into the piece. Is this wasted time and effort on my part? Never. It adds to my growing background knowledge and will help inform future articles. Even if this were not the case, I can genuinely say it was simply nice to talk with these folks and glean just a fraction of their insight. The information I gathered can, if necessary, be distilled down to a few points. One, no one I spoke with can identify an upper limit to biomass-based diesel production before feedstock markets go haywire. It’s not infinite, but it may not be as finite as some think. Two, market forces drive innovation and efficiency. Given the right market signals, sustainable supplies will follow. Three, markets—including drivers, participants and technologies—change. The difference between creative adaptation and apathetic obliviousness is the difference between success and failure. Subscriptions Subscriptions to Biodiesel Magazine are free of charge to everyone with the exception of a shipping and handling charge for any country outside the United States. To subscribe, visit www. biodieselmagazine.com or you can send your mailing address and payment (checks made out to BBI International) to: Biodiesel Magazine Subscriptions, 308 Second Ave. N., Suite 304, Grand Forks, ND 58203. You can also fax a subscription form to 701-746-5367. Reprints and Back Issues Select back issues are available for $3.95 each, plus shipping. Article reprints are also available for a fee. For more information, contact us at 701-746-8385 or service@bbiinternational.com. Advertising Biodiesel Magazine provides a specific topic delivered to a highly targeted audience. We are committed to editorial excellence and highquality print production. To find out more about Biodiesel Magazine advertising opportunities, please contact us at 701-746-8385 or service@ bbiinternational.com. Letters to the Editor We welcome letters to the editor. If you write us, please include your name, address and phone number. Letters may be edited for clarity and/or space. 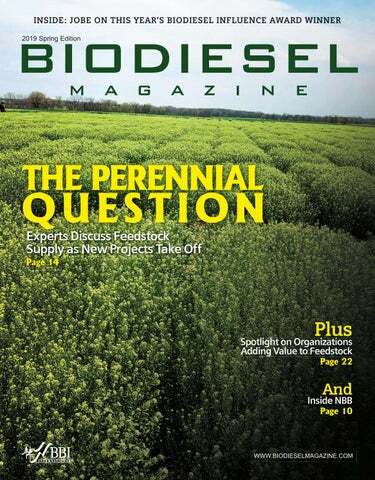 Send to Biodiesel Magazine Letters, 308 Second Ave. N., Suite 304, Grand Forks, ND 58203 or email rkotrba@bbiinternational.com. Ron Kotrba, your editor of Biodiesel Magazine since 2009 who’s been writing for the publication since 2005, was recognized in January with the 2019 Influence Award by the National Biodiesel Board. Join us next year in Tampa for the business of biodiesel! IKEA Transport & Logistics Services, CMA CGM, the GoodShipping Program and the Port of Rotterdam are cooperating in a first-of-its-kind partnership to test and scale the use of sustainable marine biofuel beginning March 19 with a landmark bunkering of the biofuel on a CMA CGM container vessel. The fuel has been developed by GoodFuels after undergoing three years of testing with marine engine manufacturers. The biofuel oil is derived from forest residues and waste oil products and delivers 80 to 90 percent wellto-propeller carbon dioxide reduction while eliminating sulfur oxide emissions. The shipping sector must switch to low sulfur fuels by 2020 while facing impending International Maritime Organization greenhouse reduction requirements. Anne Yu, Shell Hong Kong Ltd. PHOTO: SHELL HONG KONG LTD.
fraudulent activity of CEO Jeffrey Lyons. Devine has known World Energy founder and CEO Gene Gebolys for 15 years. “We all share the same vision to be able to offer low-carbon gallons downstream through the last mile of the distribution chain,” Devine says. “We’re building a production platform that’s more integrated in the supply chain than just transactionally providing biodiesel to obligated parties.” One of Devine’s focuses at World Energy is growing downstream discretionary blending of biofuels. “Our company’s initials are ‘WE,’ and that’s really what our organization feels like,” Devine says. “Gene has assembled a great collection of talented people whose common goal is not to boost our brand or us, but to act as a trusted partner to help enable downstream markets and end-users enjoy all the opportunities these low-carbon gallons can provide.” Prior to Amerigreen, Devine spent three years as petroleum liaison with the National Biodiesel Board working with Paul Nazzaro. Early this year Devine was also elected to the board of directors for the National Biodiesel Foundation. export markets such as the U.S. and Europe. The facility will make its fuel from soybean oil extracted with renewable hexane, animal fats and used cooking oil. The hydrogen required will be obtained through electrolysis of water with ThyssenKrupp technology. Crown Iron Works will supply soybean processing design and equipment, including oil extraction and treatment, and Honeywell’s UOP will supply a modular hydrotreatment plant. The entire complex will be fueled by renewable energy. ECB Group plans to start full production in 2022.
mand for low-carbon fuels in the EU, the Geneva trading desk will leverage Targray’s global franchise and in-house expertise to create differentiated value for biodiesel consumers throughout Europe. Targray’s EU biofuels business is led by biodiesel trader Vincent Cariou. Prior to joining the company in 2019, Cariou worked for nearly 10 years at agricultural commodities company Cargill, helping optimize procurement and logistics for biodiesel, vegetable oil and soybean meal customers in the European Union. to further strengthen its leadership team. Marsch is a skilled senior management consultant with 25 years of experience in the corporate world. His background includes the electric utility industry, association management, government relations, marketing, conference planning and more. Marsch will help lead an expanded national and international network of strategic partners who serve as Rock House Associates. The company expansion brings with it an expansion of its client base, which includes renewable fuel clients, petroleum refiners, electric utilities, agricultural commodity groups, private equity funds and autonomous technology companies. PHOTO: RENEWABLE ENERGY GROUP INC.
NBB Federal Affairs Efforts Remain Key Focus in 2019 The National Biodiesel Board continues to work closely with its members and allies to advocate federal policies that support growth of the industry. Securing an extension of the biodiesel and renewable diesel tax incentive, which expired at the end of 2017, is an urgent priority. In early February, NBB members traveled to Washington, D.C., to meet with their representatives and senators. In nearly 50 meetings over a two-day period, biodiesel producers and soybean growers urged legislators to renew the biodiesel and renewable diesel tax incentive as soon as possible. They discussed the financial challenges that the industry is already facing due to the lapse of the tax credit. The meetings produced a positive outcome. On Feb. 11, Reps. Dave Loebsack, D-Iowa, and Darin LaHood, R-Illinois, and 42 other representatives sent a bipartisan letter to their leaders urging a multiyear extension of the biodiesel tax incentive as soon as possible. In support of the biodiesel industry, members of Congress from across the country—from California to New York—signed the letter to House Speaker Nancy Pelosi, D-California; Republican Leader Kevin McCarthy, R-California; Majority Leader Steny Hoyer, D-Maryland; and Republican Whip Steve Scalise, R-Louisiana. “We strongly support a multiyear extension of the incentive to provide the policy certainty necessary to help the biodiesel industry and rural economies continue to grow,” the letter states. Many groups have written to ask that Congress make it a priority to extend the tax incentive at the earliest opportunity. In a March letter to Pelosi and McCarthy, members of the California Advanced Biofuels Alliance wrote, “The uncertainty created by the lapse of the biodiesel tax credit is slowing investments in new plants and raising the costs of projects to maintain, improve or expand existing plants.” The effort to convey a sense of urgency to Congress also paid off. Sens. Chuck Grassley, R-Iowa, and Ron Wyden, D-Oregon, chairman and ranking member of the Senate finance committee, respectively, introduced legislation that would provide a two-year extension of the biodiesel and renewable diesel tax incentive. “We hope that both House and Senate will address the expired tax provisions as soon as possible,” said Kurt Kovarik, NBB’s vice president of federal affairs, while thanking the senators. “Biodiesel producers have counted on the credit to secure blending contracts and financing for plant expansions and upgrades. But they are now facing the longest period of uncertainty ever, as the tax incentive remains expired two full months after the start of the year.” The House ways and means committee is now beginning a process to consider all expired tax incentives, with the first hearing held March 12.
reduction of greenhouse gas emissions and advance affordable, domestic renewable fuels to contribute to a cleaner environment. To close out the conference, NBB went out with a bang in the final session, “To 2022 and Beyond: Renewable Fuels in the Next Decade.” Influential renewable fuel industry leaders discussed RFS and what is on the horizon for 2020. “Opponents of the RFS early on thought that sustainability might be a weakness to exploit,” Rehagen said. “We knew that was wrong, that science was on our side—but we hadn’t galvanized biodiesel’s sustainability story with the data, research and scientific thought-leaders we needed to counter our opponents’ emotion-based attacks.” If you missed anything during the conference, you can visit blog.biodieselconference.org for detailed content including informative interviews, stories, photos and more. NBB hopes to see you next year at the National Biodiesel Conference & Expo in Tampa, Florida, Jan. 20-23, 2020. Industry Honors Biodiesel Champions with Annual Awards The National Biodiesel Board’s annual Eye on Biodiesel awards recognize a diverse group of individuals and organizations who have made significant contributions to biodiesel. From longtime champions to present-day breakthroughs, the commercial biodiesel industry wouldn’t be where it is today without these individuals and organizations. “These leaders are integral to the growth and development of the biodiesel industry,” said NBB CEO Donnell Rehagen, “and we would not have seen the strength in our sector this year without their extensive dedication.” Cory-Ann Wind, Oregon Clean Fuels Program Manager, and the Oregon Department of Environmental Quality— Climate Leader Award The Oregon Department of Environmental Quality administers the state’s Clean Fuels Program, which is led by CFP Manager CoryAnn Wind. The CFP requires gradually increasing carbon intensity reductions for transportation fuels, culminating in a 10 percent reduction by 2025. Following only the second year of program implementation, biodiesel use in Oregon grew to 51 million gallons. NTEA – The Association for the Work Truck Industry— Industry Partnership Award NTEA represents more than 2,050 companies that manufacture, distribute, install, sell and repair commercial trucks. It also provides indepth technical information, education, and member programs and services. NBB’s partnership with NTEA has been instrumental in getting biodiesel information to the critical audience in the work truck industry. Ron Kotrba, Editor of Biodiesel Magazine—Influence Award Ron Kotrba has been writing for Biodiesel Magazine for more than 14 years and has served as editor for a decade, going above and beyond to create awareness and provide an important platform for the voices within the industry. His depth of knowledge on the issues affecting the industry has led to strong, consistent reporting of the complex issues faced over the years. Biodiesel Magazine continues to be a critical platform for sharing biodiesel success stories that are key to building support for industry growth. Stephen Kaffka, Extension Agronomist, Department of Plant Sciences, University of California, Davis—Inspiration Award Stephen Kaffka has been a key advisor during implementation of the California Low Carbon Fuel Standard. His expertise on agricultural production bridged the gap between the good things that farmers can do, and the environmental metrics desired by the Air Resources Board and its stakeholders, who place environmental protection as a top priCasey’s General Stores—Impact Award In the past year, Casey’s General Stores has become a leading player ority. As a result, biodiesel producers are participating in an expanding in the biodiesel industry, keeping biodiesel in high consumer demand. California market while the carbon reduction goals are being exceeded. Casey’s has now converted more than 590 stores to biodiesel and plans to expand the use of biodiesel products to another 300 locations. With this prominence across the country, the biodiesel industry has an opportunity to make strides in public awareness and usage of America’s advanced biofuel. NBB Grows Washington, DC, Staff Team The National Biodiesel Board is rounding out its staff in Washington, D.C., this year. Headquartered in Jefferson City, Missouri, NBB maintains a Washington office for federal affairs and work on regulatory issues surrounding international trade, tax issues and the federal Renewable Fuel Standard. This year two new staff members joined the NBB team, Kate Shenk as director of regulatory affairs and David W. Cobb as director of federal affairs, neither of whom is a stranger to biodiesel. Shenk comes to NBB from the Biotechnology Innovation Organization where she led a regulatory affairs committee and developed analyses and comments on regulatory policies. Cobb recently served as federal affairs director for CHS Inc., a Fortune 100 company and the nation’s largest farmerowned cooperative, where he advocated for the company’s legislative and regulatory policy priorities. NEW KID ON THE BLOCK: CoverCress CEO Jerry Steiner says he can foresee farmers growing 5 million acres of his company’s modified pennycress winter cover crop in 10 years, which could yield 400 MMgy of new high-quality oil. This is only 16 percent of the targeted 32 million Midwestern farming acres that rotate corn and soybeans. PHOTO: COVERCRESS INC.
went out in distillers grains—the resultant feed product after all the corn starch is converted to alcohol. “Now, because of biodiesel demand, almost all dry mills have the capability to extract DCO from thin stillage,” Weber says. “But yet we’re still not pulling all the potential oil out, as we’re extracting less than a pound per bushel.” While local livestock market needs also determine how much DCO an ethanol producer may desire to extract, Weber says we can see additional DCO volumes in at least two ways. “One, ethanol production has not plateaued,” he says. “Exports to other regions and increased E15 demand may continue to grow ethanol production, which would increase DCO supplies. Two, ethanol producers can look at increased extraction rates. If extraction were increased by four-tenths of a pound, this would lead to 350 MMgy of additional DCO volumes. And currently not all DCO generated is going to biodiesel. A significant volume of feedstock can be pulled back into the biodiesel space.” As renewable diesel production demands more refined feedstock, Weber says biodiesel producers will continue to look at interceptor, or trap, grease. While it’s not easy to work with, demand will necessitate innovation. Your company can become a Top News video sponsor. Multiple packages are available, including a sponsor call-out from the program host with your information displayed or your own 10- to 15-second commercial at the beginning of the broadcast. - Top Stories video is accessed by 13,500 subscribers on our biweekly e-Newsletter. - Top Stories video is accessed by 20,700+ visitors per month. - Sponsor detail can be a logo or include imagery. - Name of sponsors will be included under the video link on the website. 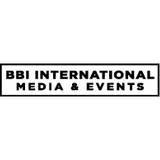 Contact us today for more information service@bbiinternational.com or 866-746-8385. PROTEIN POWER: The worldâ&#x20AC;&#x2122;s growing demand for protein drives soybean plantings, which leaves an excess of soybean oil on the market. The Minnesota Soybean Growers Association championed the nationâ&#x20AC;&#x2122;s first state biodiesel mandate 17 years ago as a way to boost farm incomes while cleaning the air, creating jobs, boosting the economy and lessening dependence on fossil fuels. everyone can get onboard with. “It’s a winwin-win-win for everyone,” he says. Minnesota blazed another biodiesel trail last year by increasing the blend requirement to 20 percent in the summer months. “Last year was our first year with B20, and we had a real good year,” says Jim Willers, a soybean farmer in Beaver Creek, Minnesota, director with the United Soybean Board, and a Minnesota Soybean Research & Promotion Council board director. Willers was among the early contingent of MSGA farmer-members taking the biodiesel message to the state capital, proposing the idea to legislators to alleviate downward price pressure from a glut of soybean oil on the market. “We went there marching around the capital, asking people about it—that’s how it started,” he says. “We went home, got organized and spent two more years working on it.” Minnesota’s biodiesel requirement adds 63 cents per bushel to a farmer’s bottom line, Hill says, and lowers the cost of soymeal for livestock producers. Willers says the B20 mandate is equivalent to removing 223,000 cars from the road. But it also adds $1.7 billion in economic impact to the state, creates more than 5,000 direct and indirect jobs, and lowers greenhouse gas emissions in this age of growing climate uncertainty. “Minnesota farmers are forward-thinking because we are at the headwaters of where things have to head downstream and overseas,” Hill says. “We’ve always been a taker of price. With biodiesel, we have the ability to add Hill value to our products. We needed something to be done, so why not do it ourselves? We can be the promoters of our own achievements. We have shown that biodiesel works well, it requires no modifications to equipment or vehicles, and it Willers helps our bottom line.” After all these years, farmer-led MSGA and MSR&PC—conceptualizers of the first state biodiesel mandate— continue to be fierce advocates for Minnesota’s biodiesel industry through fantastic truck builds like that featured on Discovery Channel’s Diesel Brothers, tours, meetings with legislators, informative publications and continued research through instruments such as a new Soy Innovation Campus. Cleaning Minnesota’s air for over 15 years. B20 available during summer months. vehicles removed annually B10 available during summer months. B5 available during winter months (2014-2018). B5 available during winter months (Implemented May 2018). Minnesota’s use of clean, renewable biodiesel blends helps to reduce greenhouse gas and particulate emissions. Learn more at mnsoybean.org. The RPS-built SBP at Calgren’s ethanol plant in Pixely,California, is being commissioned. PHOTO: RENEWABLE PROCESS SOLUTIONS INC.
increasing capacity to handle other feedstocks will bring more income. There is much discussion lately on renewable diesel vs. biodiesel. Bobbili says it’s not economically viable to co-locate renewable diesel production with an ethanol refinery. “The cost is four times that of a biodiesel facility,” he says. “Also, the margin on biodiesel is far higher than renewable diesel.” Bobbili is confident more ethanol plants will produce biodiesel in coming years. “We welcome the ethanol industry to reach out to RPS to learn more about the supercritical biodiesel process, and to see our operating facilities,” he says. The Feedstock Collection, Brokering, Trading; Co-location; Feedstock Developments; Pretreatment Technologies issue.